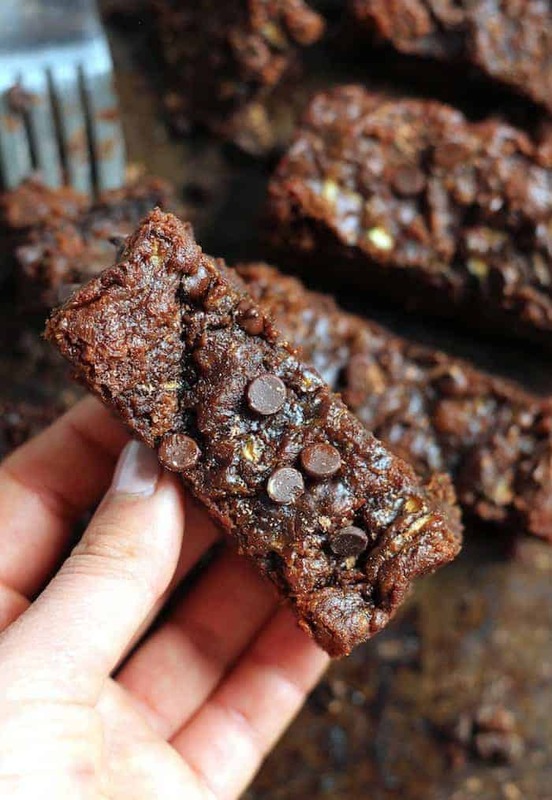 These healthy Flourless Peanut Butter Zucchini Brownies are gooey, decadent, and perfectly sweet–made with only one bowl and seven ingredients! They’re free of refined sugar, flour, butter, and oil–vegan and gluten-free. The best recipes come to me when I’m out of all the ingredients. Raise your hand if you remember my Almond Butter Zucchini Bars from three million years ago. CRICKETS. Over three years ago, I was out of flour and thus made said bars out of almond butter. It was quite the life-changing day. So what’s a food blogger to do when she’s out not only of flour, but also of almond butter? She uses peanut butter. Mainly because it was 10 for $10 at Kroger, but that’s besides the point. We’re talking the drippy kind, my friends. The kind where you open in at there’s a pool of occurring oil at the top that either nauseates you or excited you. If you’re thinking more the former, than know this. Commence the tirade! Why Does Natural Peanut Butter Have Oil at the Top? In order to get rid of this separation, companies blast oil with hydrogen (hence the word “hydrogenated”) to make the oil solid. You may not see an oily layer on top, but you also aren’t seeing the harmful trans fat lurking in traditional peanut butter. The recommended intake of trans fat is ZERO, people. Consumption of these oils is directly correlated to the number one killer in America, heart disease. It’s so naughty in fact that its GRAS (Generally Recognized As Safe) was recently revoked by the government. Long story short, all of these oils will be removed from processed foods in the coming years. If that’s not an incentive to avoid partially hydrogenated oil, I don’t know what is. End rant. All I’m saying is to buy natural peanut butter. Ingredients: Peanuts. (Salt is ok, too. Yum to salt.) It is not more expensive that regular peanut butter so leave your ‘scuses at the door, por favor. Guess what? 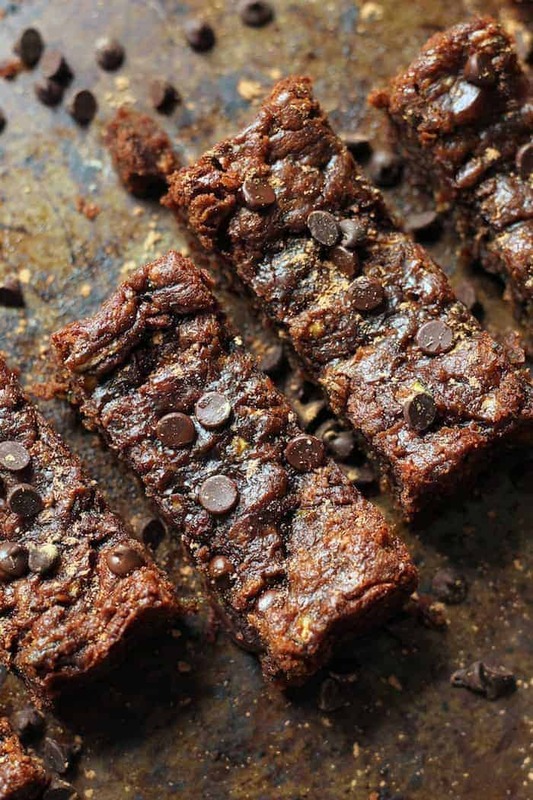 You’re only seven ingredients away from these flourless peanut butter zucchini brownies! They may be vegan and free of gluten, flour, refined sugar, and oil, but the best part is how easy they are. One bowl. ONE BOWL. At this point it’s like who even cares how they taste? I kid. They taste like my most decadent, moist, chocolatey dreams! P.S. Pretty please pretend chocolate chips are healthy for a sec and apply liberally. 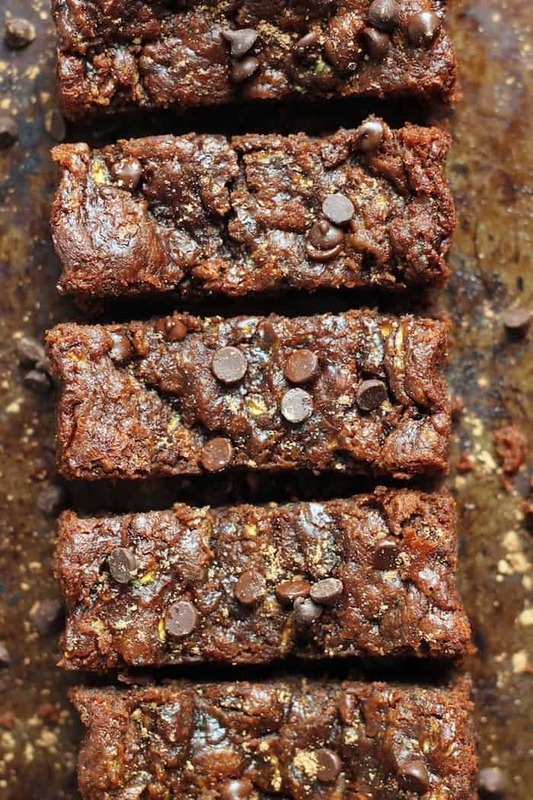 Please let me know how this flourless peanut butter zucchini brownies recipe turns out for you by leaving a star rating and/or comment! Your house is about to smell soooooo good. 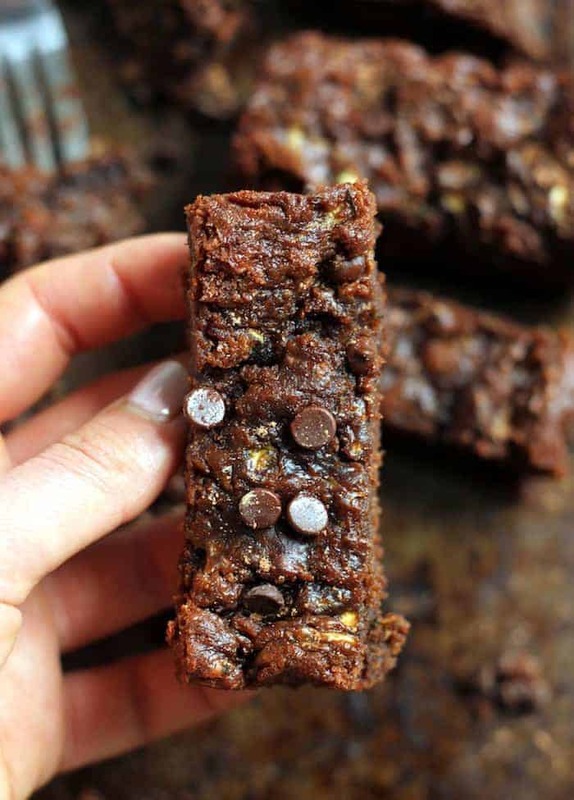 These healthy Flourless Peanut Butter Zucchini Brownies are gooey, decadent, and perfectly sweet–made with 1 bowl and 7 ingredients! They’re free of refined sugar, flour, butter, and oil. Great for those that follow a gluten-free or vegan diet and adored by those that don’t! Preheat oven to 350F. Grease an 8x8inch baking dish or loaf pan with cooking spray. Place all ingredients except chocolate chips in a large bowl. Stir until well combined. Fold in chocolate chips. Dump mixture into loaf pan and use a spatula to spread evenly in pan (you can also wet your hands and pat it down). Sprinkle top with a handful of chocolate chips, if desired. Bake for 30 minutes. Allow brownies to completely cool (I like to refrigerate mine overnight in the pan once cool) before slicing. I find that natural drippy peanut butter works best, not the hard kind. Look for the kind where the only ingredients are peanuts and salt. Can sub almond butter and omit sweetener for a paleo version. Feel free to replace flax with an egg instead if you’re not vegan. Store in an air-tight container in the refrigerator or freezer. Microwave for a few seconds before eating for those melty chocolate chips! Oh my goodness these look insane. I literally drooling at the laptop and wishing I had one of these to dip into my honey rooibos, yum. Totally adding these bars to my to make list. I love that you have whacked in some sneaky veggies too… and drippy peanut butter… I have found this Ozzie brand that is the crunchiest and drippiest with salt – so good! Crunchy AND drippy WITH salt? Drool!! These look divine…but my husband absolutely HATES maple syrup, real or otherwise, is there a substitute i could use for this?? Maybe honey?? Thanks! They don’t taste at all like maple syrup–it’s just used as a sweetener. I haven’t tried them with honey but I’m assuming that or agave or your liquid sweetener or choice should work. Thanks! Can I use unsweetened applesauce instead of maple Syrup? I make my own apple sauce and would like to avoid the sugar if they will still taste ok? These look great for when I’m on the go, can’t wait to try them! These look delish- pinning for the upcoming zucchini surplus this summer! I need these in my life!! These look incredible, Alexis. Well done, my friend. This ingredient list is amazing! And the texture looks out-of-this-world!! Seriously going to have to try this recipe soon! it frustrates me how companies are so sneaky about trans fat…that needs to GO like yesterday. Thank you for your “rant” on natural peanut butter! ?? These look fabulous! I will be making them soon! So birthday party this weekend… I usually make black bean brownies in a cake pan so lots of people can enjoy them… Help me with proportions I make that big of a batch, pretty please? I need to make these instead!!! I’d say maybe triple or quadruple in a 9×13 pan? Holy craaaaaap, Alexis. These look AMAZING!! Definitely going to be making these this weekend! 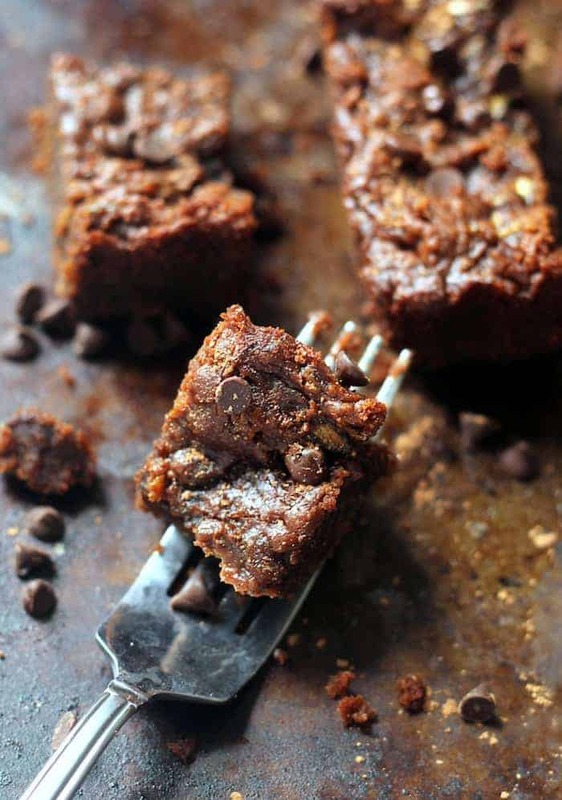 I have some zucchini just waiting in the fridge to be used up, and I’ve been craving brownies lately! Making TODAYYY for my mommas birthday! Hope you love them, Caitlyn! mmmm, so moist. i’m drooling, and hungry for chocolate and nut butter! chocolate chips are DEFINITELY healthy. trust me, i read it on the interwebs somewhere…. the hardest part of making these was not eating them right away and putting them in the fridge overnight! i can’t wait to have one later today! on a snapchat note…I’m following you but haven’t seen anything! and I doing something wrong? or just nothing there yet? Hmmm so strange! Did you spell it right? I’ve been posting! Maybe try searching Alexis Joseph? I re-searched, checking spelling :) and it shows Hummusapien with your full name under it, so I unfollowed and then refollowed. I can click on it and see your profile pic thing? but nothing shows up in my stories from you. maybe you have it set so only your friends can see snaps? Made these today. Mine didn’t turn out as pretty (more crumbly)…. but SO SO tasty!!!! I have made about a dozen items from your website and NEVER been disappointed. Lately I spend my free time lurking around your blog for the next thing I can make. Thanks for being so fabulous and for all the creative, yummy food ideas. You are the best! I doubled my batch and put in a 9×13 pan. They were very delicious, but dry and crumbly. I will try adding an egg next time. I’m not sure how flax would make it less crumbly. Would water help? The taste was amazing! I’m so surprised at how tasty they were! I made these using almond butter and, as I didn’t have chocolate chips, I chopped a couple of squares of Belgian chocolate, and opted for the splash of natural vanilla extract. This recipe is quotes simply one of the best desserts I’ve made. It also has the added benefit of being relatively healthy! Brilliant result, so many thanks Alexis! Ok my peanut butter purchasing habits need a makeover after reading this. I usually go with JIF Natural just because I grew up on JIF, but ya girl is moving on (because there’s no oil at the top like you said!). These look so ooey gooeyyyy yass need to try!! OH MY. Making these ASAP. All about that drippy PB gal! Okay, this is one thing about being a grown-up that I don’t mind at all. This looks AMAZING! You are on a zucchini roll, sister! I am shocked these are flourless. That shiny crust is like, life. I NEED!! THE SHINY CRUST IS LITERALLY MY DREAMS!!! These are so delicious. I made them for a BBQ and all the kids couldn’t get enough. I’ll definitely be making these again!!! Thank you!! Yay! I love to hear that they’re kid-approved!! cannot believe they have no flour but have a cakey taste! Nailed it Alexis ! These are delish. Not too sweet, but totally satisfying!! For an 8×8, would you suggest doubling recipe? Thanks !! Made these in 8×8. First time around with 30 min cook time and turned out over cooked and dry. Second time followed recipe again as is (with maybe a few more than a few more choc chips ;) and baked for 17 mins. Perfectly cakey and moist and yummy! Okay, so I made these last night. First of all… YUMMY!!! BUT… I kept feeling super uneasy about using a loaf pan. I thought for sure my brain had confused the names of ALLTHEPANS, because these turned out quite tall, more cake-like, than brownie-like. Delicious! Love them! But I was expecting something a bit flatter and gooeyer… You were talking a loaf pan that you would make a quick bread in, right? Would 30 minutes be too long to do these in an 8×8 pan? It’s hard to tell how “tall” your are from the pictures. Hey Amy! Hmmmm your loaf pan sounds right. Mine didn’t get that thick so I’m not sure what happened. Did you use more than 3/4 tsp baking soda? I haven’t made them in an 8×8 so I’m not sure, maybe check them every ten min? I have made your black bean and zucchini cookies a number of times and really love them. Today I thought I would try this recipe instead. It was a lot quicker to put together and get in the oven. Oh my gosh these are amazing! I thought the cookies were good, but the taste and texture of these is so much more like eating a real brownie. I think I have my new post workout favorite. Thanks for sharing all your yummy recipes. Made this tonight and they were UNbelievable. !!!!!!! I used sun butter (for the first time!) and was surprised by how into it I was! Def going to try again with peanut at some point though. New favorite! These are AMAZING! Made them last night with agave instead of maple syrup, the turned out wonderful! My husband is newly vegan and was craving chocolate! Omg…what?! These are insane! Followed the (super easy) recipe exactly and boom! Ive been storing in the freezer and throwing one in my lunch bag everyday. By lunch it is perfectly amazing- moist peanut butterey, chocolatey- i die every time!!! Mine are a bit crumbly also as someone mentioned, but the crumbles dont count as a brownie…they are yummy extra free stuff! Will try the extra flax as suggested and let you know if it helps, but girl, these rock! They look super yummy!!! Silly question but does the zucchini have to be cooked beforehand? Do you think it would work to sub the maple syrup for swerve or erythritol? I have type 1 diabetes and like to keep the carbs low! Hmmm I honestly am not sure since it’s liquid :/ I’m sorry! I added walnuts on top, and mixed the choc chips in. They are baking, now, hope they are as good as they look! I’m all for the drippy peanut butter. I honestly can’t believe some of my friends would snigger at me when I open a new jar of natural peanut butter and they’d berate me for wanting to ingest all that oil! The only thing what I changed, that I added a ¼ cup of Stevia to the batter. These are amazing! I didn’t have maple syrup so I substituted an equal amount of honey. I also used one egg and one tbsp of flax seed (not ground). Super moist! Thanks! What kind of chocolate chip do you recommend? Dark chocolate? Semi-sweet? Thanks! I like the one’s from Trader Joe’s. Semi-sweet is my go-to! I always go for dark chocolate! The Whole Foods brand has a bag of dark chocolate “chunks” that I’ve recently discovered and they’re AMAZE. I made a batch for myself and the next day I made another batch to bring out because they were soooo good! No one would have guessed they had zucchini in them either. I love and adore this alternative to other brownies filled with processed/refined sugar and flour etc. I use an egg instead of flaxseed so I can’t comment on how they would be otherwise but ABSOLUTELY DELICIOUS! Can’t get enough of them – I’m baking another batch right now :) thank you, thank you, thank you! This makes my heart so happy! Bringing amazing people like you these recipes is what keeps me motivated. Eat on! Just made these today. I did double the recipe and baked them in an 8×8 pan. They turned out great. I did have to bake about 20 minutes longer. They were moist and chewy. Not real sweet. If I could post a pic I would. I’m getting ready to freeze them for my vegan company coming this weekend. So happy you like them! Yum they are so good straight outta the freezer and I hope you and your company have a great weekend. These are crazy good! I can have brownies again, thanks to you. I admit I had my doubts making it. The batter was delicious, but would it really bake up like a brownie? And hold together? Yup and yup! Genius! I was able to cut the maple syrup to 2 T since the semi-sweet chips added some sweetness. Perfection! Real peanut butter is SOOO much better! Taste and health-wise, Alexis, thank you for publishing this in your recipe! The mess of stirring up Natural PB is usually the biggest turn off most people have to using it regularly. I found the solution to this problem: Grandpa Witmer’s Old Fashioned Peanut Butter Mixer, a product that should be sold alongside all jars of “drippy” PB!! You replace the jar lid with this lid which has a “S” curved metal rod with a knob/handle on one end that fits through the lid like a butter churn. You crank it for a short time and wa-la! Mixed PB! No drippy oil over the side of your jar. You have to experience this!! PS Make sure you buy the right size lid for the brand of PB you usually buy. Do you think Carob Powder or Cacao would work just as well? These can out very good…I was surprised at how good! Not as sweet as regular brownies (obviously) but they had a nice rich, fudgey texture and they 100% satisfy a sweet tooth craving. Will make again! So glad! They’re a fave around here for sure. It says to refrigerate. If I do that, but then have then sit out for a few hours as people graze on them, will that be a problem? I do t want them to gradually come to room temp and then be a pile of gooey goodness that’s also extra messy ? Yes that’s fine! Just don’t keep them on the counter for days. Made these yesterday. For something healthy, they were delicious. Highly Addictive. Cake like and since I used crunchy peanut butter, they had a great textureI love how simple the recipe is. I will definitely be making these again.